I must begin by stating that I am by no means against integration…. My comments are not to promote racial separatism, nor to argue that people of the same “race”–-and we must always signal just how time- and place-specific “race” is–“naturally” want to be around each other…. Instead, my point is simply to identify the following conundrum of integration politics: Promoting integration as the means to improve the lives of Blacks stigmatizes Black people and Black spaces and valorizes Whiteness as both the symbol of opportunity and the measuring stick for equality. In turn, such stigmatization of Blacks and Black spaces is precisely what foils efforts toward integration. After all, why would anyone else want to live around or interact with a group that is discouraged from being around itself? I thought of this problem, and this roundtable, while reading about FiveThirtyEight’s fascinating metric for residential racial segregation in American cities. By creating “diversity indices” at both the metro area level and neighborhood level, Nate Silver was able to distinguish between two relevant kinds of racial makeup, and – by subtracting one from the other – create a segregation statistic that takes into account the fact that Salt Lake City’s overall population does not look like Atlanta’s. In doing so, Silver came to the (perhaps not so surprising) conclusion that more diverse cities also tend to be more segregated. But another number jumped out at me from this analysis. Or rather, the lack of one: New York City did not appear on the “most segregated” list. Why was this? After all, on what is probably the most-cited measure of segregation, the dissimilarity index, metropolitan New York City ranks as the third-worst city in the country for black-white segregation (behind only Detroit and Milwaukee), and second-worst for Hispanic-white segregation (behind only Los Angeles). The answer, of course, has to do with the difference between Nate Silver’s segregation index and the dissimilarity index. Silver’s measure looks at whether people of any racial or ethnic group live in neighborhoods where they’re as likely to run into people of other groups as they would be in their metropolitan area as a whole. That is, you get a really bad score for having neighborhoods that are made up overwhelmingly of a single racial group. In New York, this kind of single-race neighborhood is relatively rare, while in Chicago it’s almost the norm on the South and West Sides. 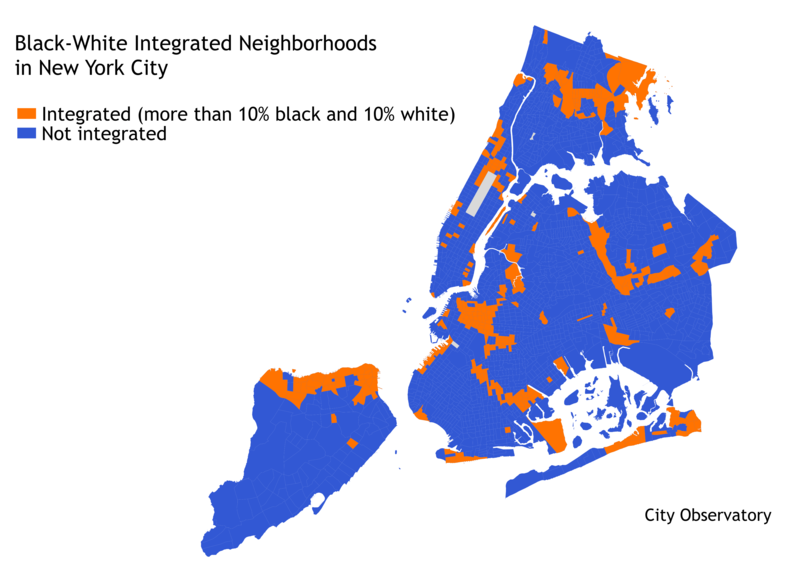 Why, then, does the dissimilarity index suggest that New York is so segregated? So which measure is “right”? Both of them, of course – they just answer different questions. But to bring us back to the Furman Center’s roundtable, I think at this point it’s useful to ask why we think segregation matters. If the answer is that we think that our lives are enriched by being in proximity to – and, hopefully, forming meaningful friendships with – people of other backgrounds, then Silver’s index makes sense. Living in predominantly black neighborhoods affects the life chances of black Americans…because black neighborhoods have been the object of sustained disinvestment and punitive social policy since the emergence of racially segregated urban communities in the early part of the 20th Century. Residential segregation has been used consistently over time as a means of distributing and hoarding resources and opportunities among white Americans and restricting resources and opportunities from black Americans. Racially segregated communities provide one of several mechanisms through which racial inequality is made durable. That is, it’s easier to send black children to inferior schools if their schools are all on one side of town, and white schools are on the other. It’s easier to target housing and mortgage discrimination against blacks – one of the most important causes of the wealth gap – if all the black-owned houses are in one area. It’s easier to unleash abusive policing and incarceration practices on black communities without disturbing – or even attracting the attention – of whites for decades if whites and blacks don’t live in the same neighborhoods. The New York Times‘ visualization on how the neighborhood a child grows up in affects their future earnings reinforces this idea. As Yonah Freemark pointed out, a map of counties where social mobility is worst looks pretty similar to a map of counties with large black – or Native American – populations. And that includes the large black populations in the New York metro area. If this is why we care about segregation, then Silver’s measure – which doesn’t care which racial groups are mixing, as long as there is some mixing going on – is less useful. What matters then isn’t just integration: what matters is that privileged groups live in the same places as traditionally oppressed groups, so that place-based discrimination is made more difficult. In the United States, that means whites and people of color living in the same neighborhoods. Where that doesn’t happen – even if an area is integrated with, say, blacks and Latinos – then place-based discrimination is still viable, and it will be much easier to reproduce racial inequality. This is also at least a partial resolution to Mary Pattillo’s concern that wringing our hands about the problem of segregation could, effectively, be implying that black people and their neighborhoods are inferior. Instead, focusing on place-based discrimination underlines that segregated neighborhoods aren’t inferior – they’re just more vulnerable to discrimination from more powerful groups whose members don’t live there. That, of course, is not the end of the story, and there are other tradeoffs involved in integration. But focusing on this rationale provides some clarity both to conversations about, and measures of, what continues to be one of the defining traits of the American city. * Here, for the sake of convenience, I’ve switched to city, rather than metro-area, numbers, but I promise it looks pretty much the same at the larger scale, too.